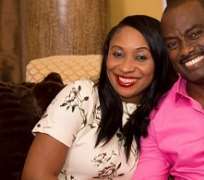 Popular entertainment personality, Dayo Adeneye and his wife, Caroline are just that two love birds who have been married for about 15 years and still counting but there are lots of work that has been done to ensure that the marriage wax stronger as the day goes by. For such a busy man like Dayo, one begins to ponder on how the wife has been able to cope with his tight schedules and female admirers knowing that he is always at various events both and out of the country. Caroline in a recent interview with Asabeafrika, stated that she is not sure that there is no woman that would have not sent love message to her husband but she has no time to go through his phone. Caroline explained that going through Dayo's phone will not add any value to her because one is bound to see various things which will end up causing headache but appreciated the husband for always making her happy.